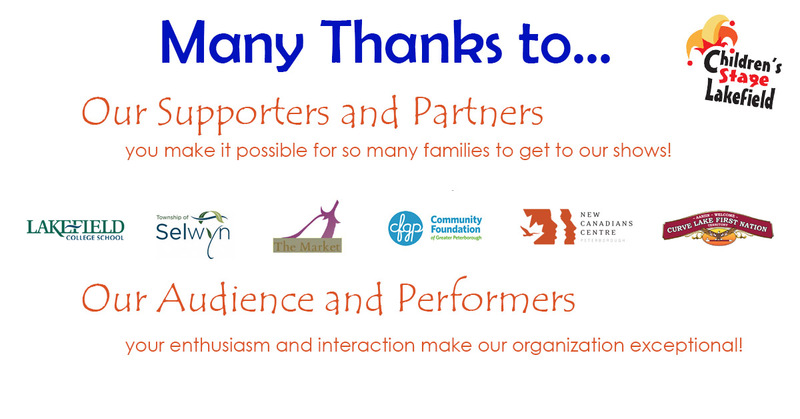 Children’s Stage Lakefield would like to thank the following sponsors for their generous donations. Their support broadens our kids’ experiences and enriches their lives. If you’d like to donate please click on the donate button near the bottom of this page. Children’s Stage counts on the generous support of individuals in the community. If you would like to help bring high-quality performancers to our community so that kids and families can continue to experience the joy of live performances, please consider becoming a ‘Friend of Children’s Stage Lakefield’. All donations over $20.00 will receive a tax credit. Donors will be recognized on our website and performance programs unless otherwise preferred. Feel free to contact us directly to make a donation or donate through PayPal by clicking/tapping on the Donate button below. You don’t need a PayPal account – you can donate with your credit card too.